Stargazers will be treated to three lunar events in January, including a rare Super Blood Wolf Moon, which will happen in the early hours of Jan. 21. 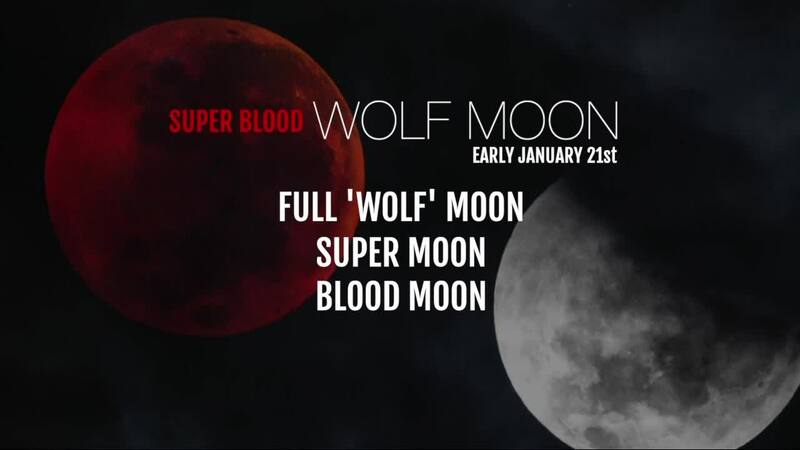 (WXYZ) — Stargazers will be treated to three lunar events in January, including the rare "Super Blood Wolf Moon," which is expected to happen in the early morning hours of Monday, Jan. 21. Each month's full moon is called something different, and January's is a "wolf moon." This month's full moon is also a Super Moon, when the moon is closer than usual to the earth. It's also a blood moon, or a total lunar eclipse. Together, those create the "Super blood wolf moon." The next time you'll be able to see this rare occurrence will be in 2036.